The super blade is the biggest brother in the Blade family and offers the highest efficiency, but still has the all round capabilities. The fuseage is all composite fibreglass with carbon reinforcing, this makes it strong but light. It has a removable canopy with enough room to take a large motor and battery. the wing is in 2 pieces and has a RG15 modified profile to offer the best performance in a wide range of speeds. The glider also has 2 all moulded V tails which are easily detachable for ease of transport. Suggested servos are: 4 x HS125 wings. 2 x HS85 mg V tail. 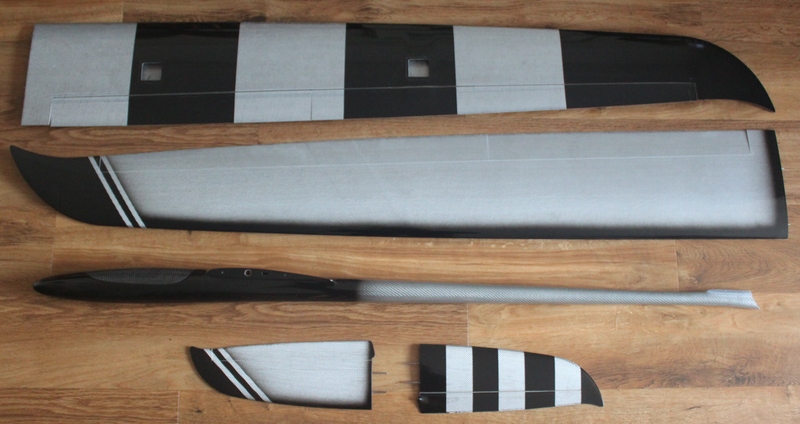 2 x carbon tubes for elevator & rudder, 1 x 10x210mm wing joiner, 4 x aileron & flap threaded horns, 2 x male & female MPX connectors, 8 x M2 steel threaded pushrods, 6 x M2 clevises, 1 x 45mm motor mount, 2 x servo covers, 2 x V tail nylon ball link cups, 2 x steel V tail ball links, 2 x M2 pan head bolts for V tail.